Evolution is a funny game. Like everything else in nature, there is a tinge of ruthlessness about the whole thing. In the way the weak are set aside for the strong. How only the best have a chance at progress. On the face of it, these cars seem to be the weak ones. Holding out and sticking to a form that seems to be losing favour with each passing day. But is there a revival in sight? 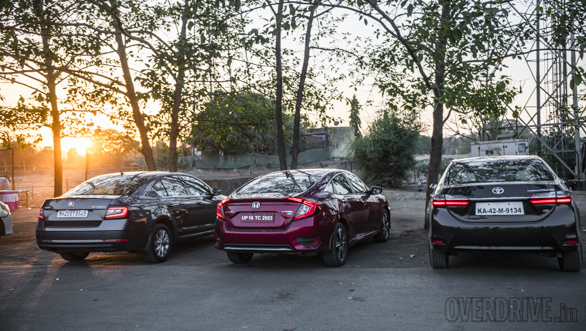 The all new for 2019 Honda Civic has sold more in a few months than the other two here have managed in a long time. But more importantly, does the Civic have what it takes to reignite people's interest in these cars or is it just hype around a well-remembered name? 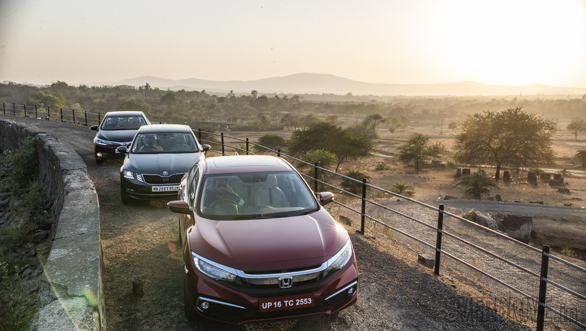 The Honda Civic's looks deserve all the hype they can get. The car's most striking part is the silhouette. The way the low, squat nose leads to purposeful haunches and then to an aggressively coupe-ish roofline, marks the Civic out to be the driver's car. 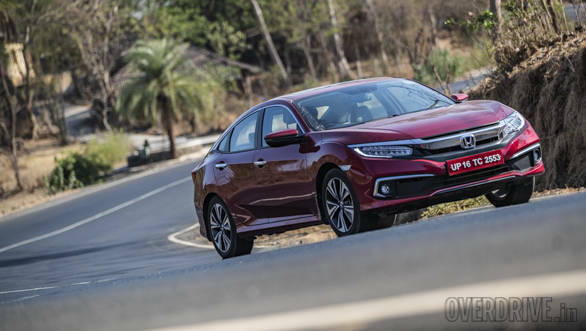 Add to this details like the slim LED headlamps, the low bonnet that seems to be placed at a slight indent to the wheel arches, the notchback boot and the crab-claw tail-lamps, and you have a car that looks twice as expensive and twice as quick as it is. 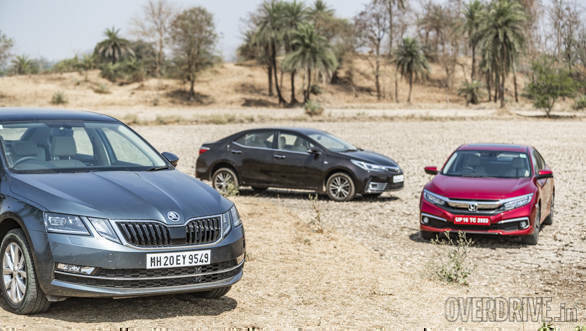 The Toyota Corolla Altis and Skoda Octavia are, to varying degrees, at the opposing end of the style spectrum. Both cars have been around for some time now and it shows. The mid-lift facelifts have helped but they are generally playing catch up to the Civic. The Corolla is the closest to the traditional three-box shape. 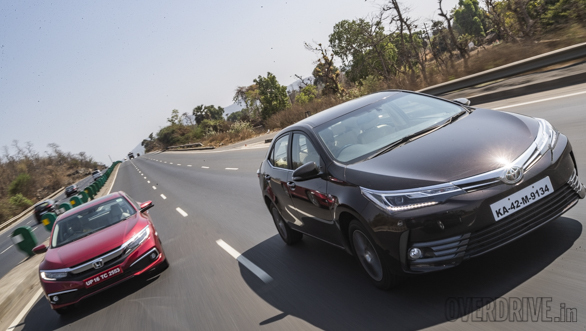 Some excitement comes from the swept-back headlamps and multi-slatted air dam in front but from then on the focus seems to be on practicality. The upright glass-area, flat sides and simple boot make sure of that. The Octavia is slightly better. I personally find the quad LED set up and the more roundness that the facelift brought with it not as convincing as the understated class of the earlier car. But the sculpted bonnet, simple but authoritative characterlines and correct proportions bring a sense of authority to the Skoda. It also does a better job of putting forth its superior sense of quality to an onlooker. 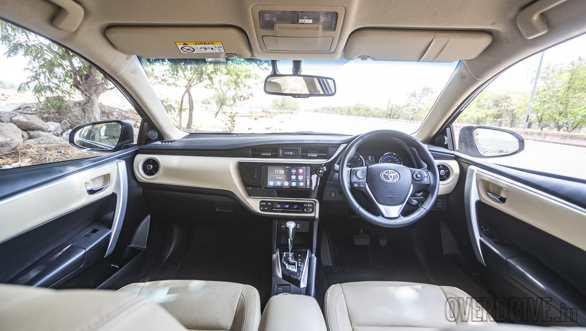 The Corolla's cabin feels airy. A feeling reinforced by various bits on the inside like the flat faced dash and light beige colour scheme. It's also great for rear passengers. It's the only one with a flat rear floor and has a comfortable seat back angle and cushioning both front and back. It loses out from here onwards though. The design feels dated, with everything from the dials, the very aftermarket looking infotainment system and the gated shifter all feeling out of place in this group. Not helping are the various plasticky bits which feel hard and scratchy around the lower half of the space and even on touch-points like the steering wheel and stalks. But the Toyota's biggest failing is its truncated features list. 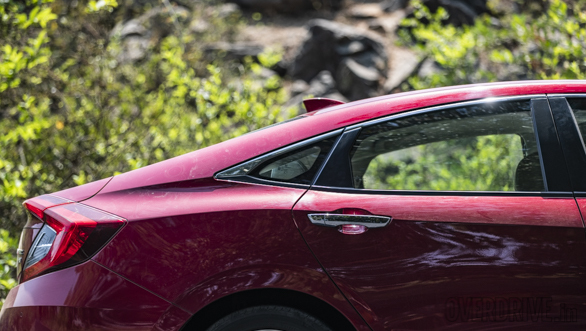 Its missing the small things that add up like dual-zone air-conditioning, rear AC vents, one-touch up-down for the windows and a sunroof. In stark contrast is the Skoda. Everything you touch feels as expensive as it looks. The gloss black bits unique to this top-spec L and K trim bring more richness. The layout is the most logical with everything being exactly where you think they are. 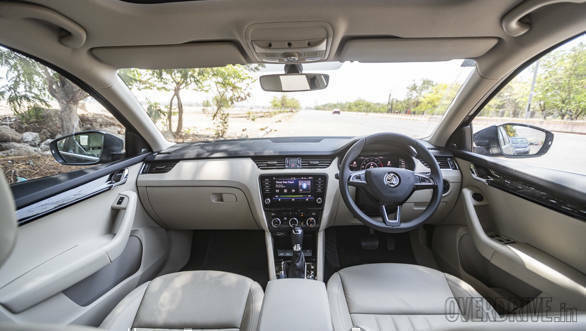 The highly functional virtual cockpit instrument cluster, the crisp large infotainment screen, the nine-speaker Canton stereo, the panoramic sunroof and ambient lighting make for an elevated driving experience. But the Octavia's biggest advantages are the masses of rear legroom and the practical bits like the massive 590 litre boot and the split folding seats. If anything, we would have liked better seat cushioning. Like on the outside, the interiors of the Civic egg on the boy-racer in you. 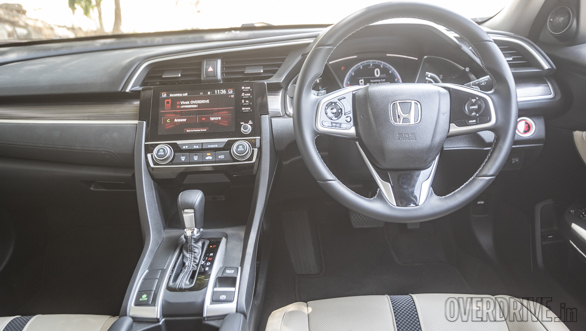 The low-set driving position with the perfectly positioned steering wheel, the centre-armrest that feels like its enveloping around you, the swept-back dash and the deep-set instrument cluster bring to life all your JDM fantasies. There's something in it at the rear too. The cushioning, under support and headroom is close to the Corolla's. 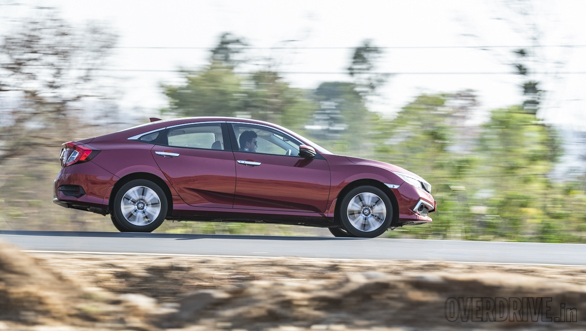 To top off, the Civic scores high on practicality. The floating design for the centre console allows for a lot of space for knick-knacks and the doors pockets hold a couple of regularly sized bottles easily. The things we don't like? Quality of materials and fit is below par in this test. There are hard scratchy plastics all over the dash. The centre console buttons feel flimsy as does the unsupported rear armrest. The low set cabin also means that getting in and out is not as simple. This is one aspect where all of them are at par. All the cars here get a driver, passenger, side and curtain airbags. Also available is ABS, EBD, a hill start assist and ISOFIX seats. Each one also gets a special touch which shows more accountability. 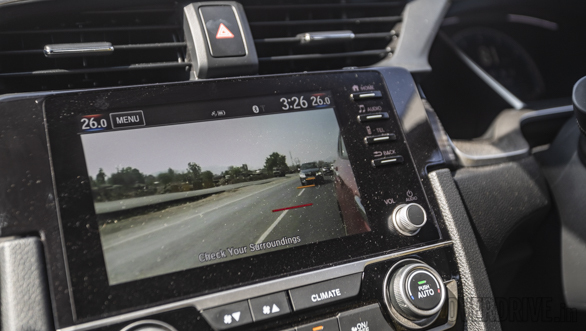 There's the Civic's lane watch side camera, the Octavia's all-round parking sensors and the Corolla's eight standard airbags. A clear divergence seems to be forming here. Both the Japanese cars get a 1.8-litre naturally aspirated petrol motor paired with a seven-step CVT. The one in the Civic puts out 141PS at 6500 rpm and 174 Nm at 4300rpm. The Corolla's motor will give you a very similar 140PS at 6400 rpm and 173 Nm at 4000rpm. Consequently, they behave largely similarly but with some unique traits. The Civic motor, as expected of a VTEC, is inherently smooth, sounds rorty and is clean revving. But its gearbox is a real party-pooper. Ask it for anything more than to potter around the city, and it struggles to keep up. The rubber-band effect is prominent and this seems to constantly keep the car on a tight leash. This means that overtakes or any spirited driving needs some planning. Sticking it in Sport or taking manual control improves the situation mildly but still nowhere up to making the whole experience cohesive. The Toyota goes slightly the other way. 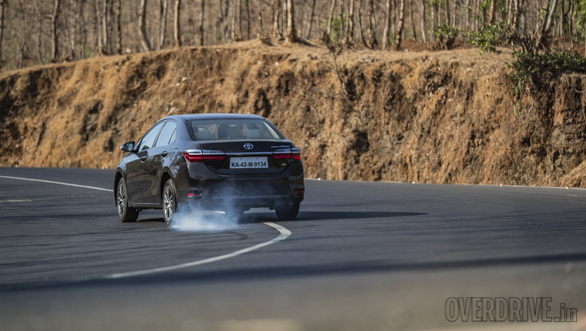 Here the CVT is less conservative and seems to not dull down the engine as much. It behaves closer to a traditional automatic in that sense. The rubber banding is still present but taking manual control seems to keep it in check. But then the engine isn't as responsive and takes a bit more time to build revs, so effectively the entire experience still feels somewhat unnatural. The Skoda is completely on another plane here. And is a clear example of why we have gotten so used to turbocharged engines. Sure, the sensation of an engine racing to its 8000 rpm limiter is missing but its 1.8 litre turbocharged motor with 180PS at 5100 to 6200 rpm and 250 Nm at 1250 to 5000 rpm is a more than adequate replacement. 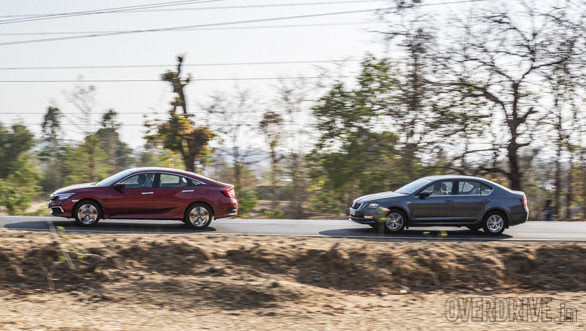 The low-end torque means you are always in front of traffic and can exploit the smallest of gaps with confidence, The engine is always in its powerband, whether you're negotiating corners or steadily cruising on the highway. The seven-speed dual clutch automatic is a perfect complement too. It shifts seamlessly and always makes sure you have power on tap. 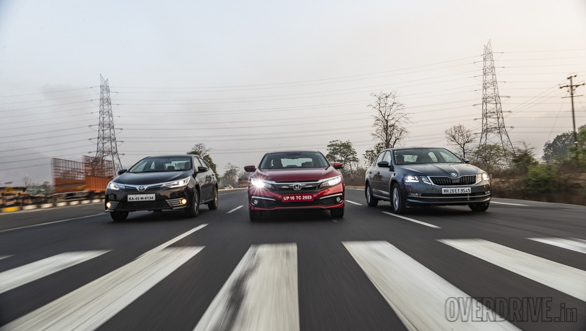 To put all of this in perspective, at 8.6s to a 100 kmph, our testing showed the Octavia to be a good three seconds quicker than either the Corolla or Civic. The Skoda's set up pays dividends at the fuel pump too. Our testing got us an overall fuel efficiency figure of 13.76 kmpl. This is marginally lower than the Corolla's 14.01 kmpl and some way ahead of the Civic's 12.02. 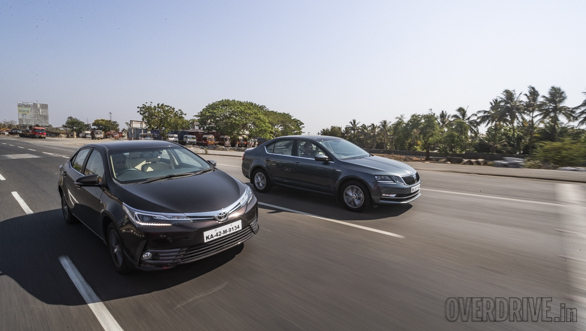 The Altis' 13.34 kmpl is most efficient city figure while the Skoda is best on the highway with 16.7 kmpl. Start driving the Civic and you immediately realized where all the racy heritage comes from. Honda has done a brilliant job here in getting the balance spot on. The Civic has sharp turn, very little body movement and stays composed at any speed. There is a sense of tautness that brings with it loads of confidence. And there is no compromise. 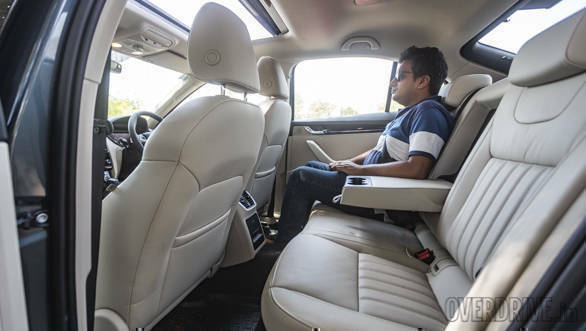 Rear seat passengers will never be tossed around over bumps, the car absorbs most rough patches with ease and very little filters through. The Toyota also does a good job of filtering out bumps. But there is a compromise to make. The Corolla is soft in its suspension set up and body roll is evident around corners. There is also quite a bit of vertical movement over undulating patches. Another factor that marks out its age is that the amount of road and wind noise that filters in, making long journeys not the most soothing. The Octavia follows a middle ground. 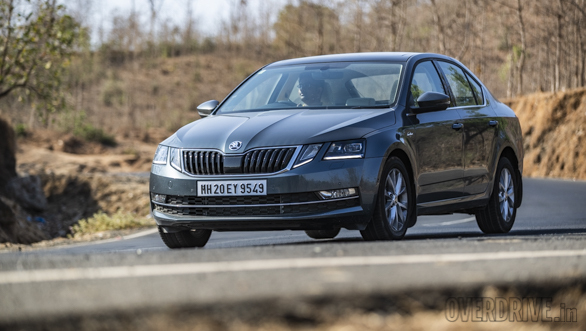 Skoda softened the car's set up a bit with the facelift and it now does a better job of tackling our roads. But some of the bigger bumps still filter through and the car is still quite noisy over the rough stuff. What helps is the refinement levels. There is very little road, wind or engine noise coming through. Like the Civic, this gets a multi link set up at the back too, but the car isn't quite as sharp as the Honda. There is a slightly more body movement and turn in is a bit slower too. The Civic and Octavia also get very similar steering set ups. These are light and effortless in the city but weigh up the faster you go. 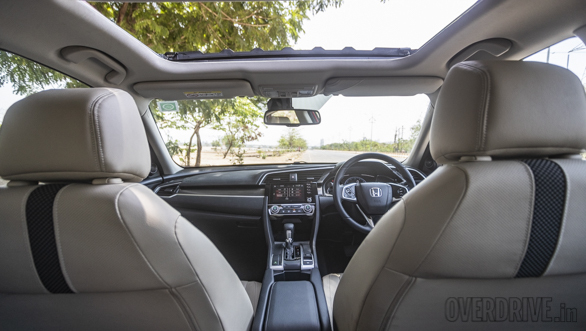 The Civic brings with it a tinge more sharpness, adding a bit more heft off-centre. The Altis is the most effortless for the city but again fails to balance this out by not adding weight the quicker you go. 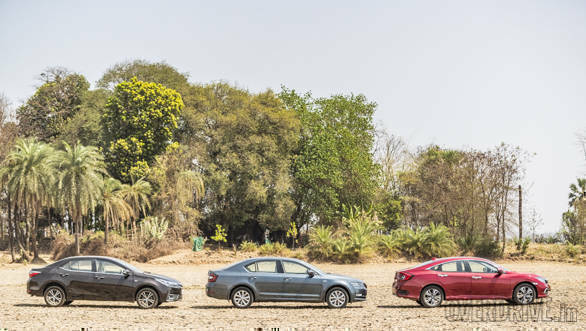 At Rs 28.29 Lakh OTR Mumbai, the Skoda Octavia 1.8 TSI Laurin and Klement is around three lakhs more than the Honda Civic ZX's Rs 25.16 lakh and four lakhs more the the Toyota Corolla Altis VL's Rs 25.16 lakh. This premium seems justified given the vastly superior powertrain and longer feature list. In fact, the Corolla feels the least cost-effective, given its glaring feature omissions. 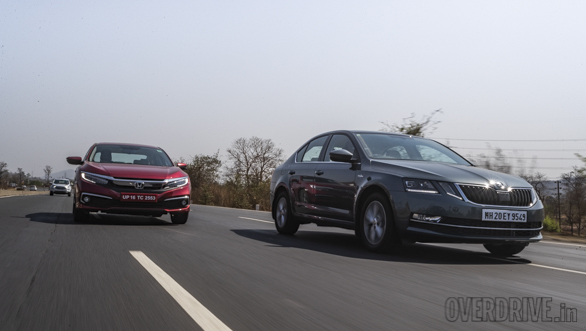 Further the Octavia has the widest variant range, so one to suit your budget is never far away. 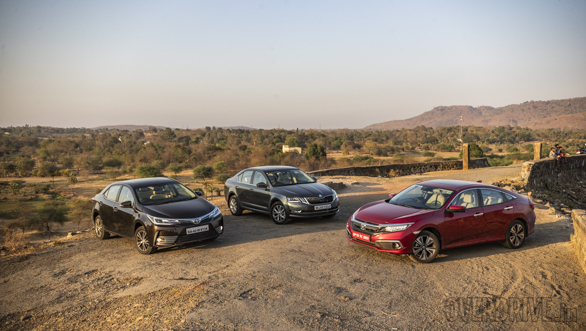 All three also come with strong warranty packages and extended warranty options, so owning one is unlikely to be very stressful. The Civic, in this petrol VX guise, stops just short of being the revelation that it could be. It seems shackled by its gearbox and a bit confused by it. It's looks massage your ego and it tries to provide for both the driver and the passenger, but the effort isn't cohesive. This is exactly why the Octavia still feels path-breaking. There's something in it for everyone. Its interior ambience and packaging brings comfort and class. The drivetrain adds to this a wallop of ability. The Corolla is not far behind these two, but just misses the finesse and duality of purpose that is expected in this segment.